Pick your best Super Sunday 11 for Gameweek 25 and win £25.00 cash – FREE ENTRY! Manchester City are looking to get back to winning ways when they host Arsenal on Sunday, while Leicester host a Manchester United side that remain unbeaten under Ole Gunnar Solskjaer. There are just 2 matches in this weekend’s Sunday contest on Starting 11, so it’s a nice simple one for all to get involved with, £25.00 going to the winner of FPLTips’ Sunday-only Mini League. 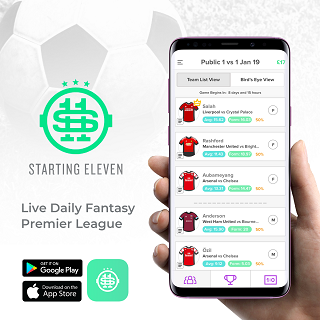 Before creating your daily fantasy lineups and entering FPLTips’ FREE ENTRY £25.00 1st place prize Mini League for Sunday, let’s take a look at some players to consider for this weekend’s contest. Man Utd have conceded 6 goals in 7 games under Solskjaer, keeping 2 clean sheets, with David de Gea producing an average of 3.3 saves per game. Leicester have scored only 3 goals across their last 4 home games; only Huddersfield, Crystal Palace and Cardiff (each 2) have managed fewer. Arsenal have scored just 4 goals in their last 4 away games and face a Man City side that have only conceded 10 goals across their 12 home matches this season; only Chelsea (9) and Liverpool (7) have let in fewer. Aymeric Laporte has featured more than any other Man City defender this season, starting in all but one game and playing a part in all 10 of his team’s clean sheets. Since breaking into the team in Gameweek 11, Sead Kolasinac has produced impressive totals of 22 chances created and 7 big chances created, with Lucas Digne the only defender to rack up more of either (28 chances created, 8 big chances created). Ricardo Pereira has often played ‘out of position’ in midfield for Leicester and no defender has created more chances (10) in the last 6 Gameweeks or been involved in more goals (3), while only van Aanholt (11) has taken more than his 10 shots. Paul Pogba is expected to overcome his knock to lineup against Leicester on Sunday and will be hoping to continue his impressive form under Solskjaer. No player has taken more shots on target (10) or from inside the box (15) in the last 4 Gameweeks. Man City have scored 53 goals in their 24 matches, a league-high and an average of over two per game. The defensive form of their opponents offers plenty of reasons for optimism. Arsenal are yet to keep a clean sheet on their travels, conceding 22 goals in 11 matches. David Silva and Kevin De Bruyne appear to be first choice options to partner Fernandinho in the midfield 3, although Bernardo Silva remains an alternative, having only appeared from the bench in the last 2 league matches. In his last 4 home matches, James Maddison has taken 14 goal attempts and created 15 chances and the attacking midfielder has directly contributed towards 9 league goals this season (5 goals, 4 assists). He’s created 5 big chances during home matches this season; on par with Hazard and just one fewer than Salah (6) has produced. Pierre-Emerick Aubameyang found his 15th league of the season during the win over Cardiff last Gameweek and in the last 6 Gameweeks, only Mitrovic, Rashford (each 18) and Pogba (20) have taken more than his 17 shots inside the box. Only Salah (24) has been directly involved in more goals than the Arsenal forward (21) this season. Marcus Rashford has returned 5 goals and 2 assists in 7 league games under Solskjaer, producing a total of 21 shots inside the box over that period; more than any other Premier League player. Only Pogba (19) has taken more than Rashford’s 16 efforts on target in the same period, while only Aubameyang (5.4) and Salah (6.2) have a higher expected goals figure (4.8). A goal against Newcastle saw Sergio Agüero find his 11th league goal of the season and the Argentine has started in 5 of the last 6 matches, returning 3 goals and 2 assists. In 20 appearances this season, the 30-year-old has produced a tally of 57 shots inside the box, with only Mitrovic (61) taking more. The Champions have scored a staggering 40 goals in their home matches, and given Arsenal’s away defensive record, the fixture is an excellent one for Man. City on paper, so Sergio Agüero is a strong contender for the armband. 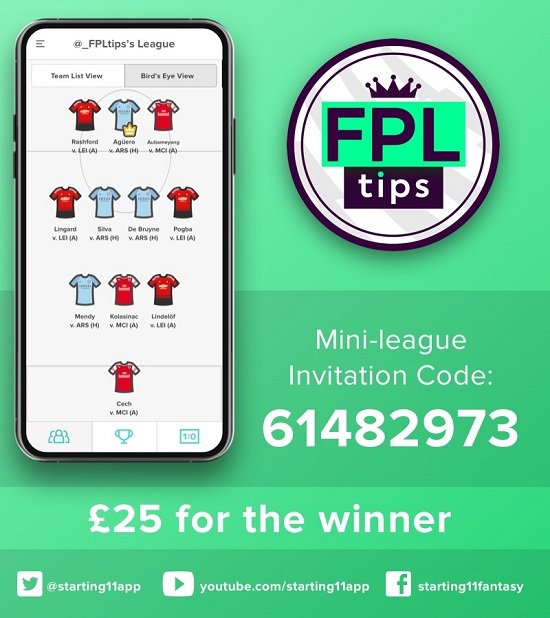 BEFORE YOU GO… We’ll be giving away another £25.00 in cash to the winner of FPLTips’ SUNDAY ONLY Mini League on Starting 11 this weekend. 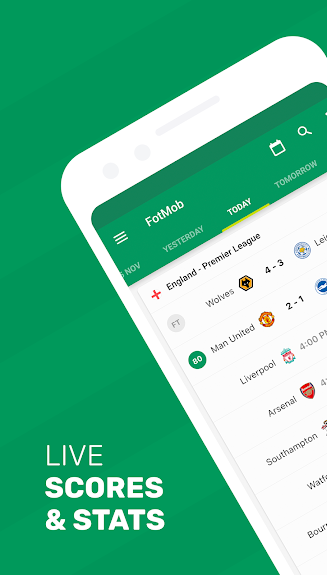 Simply download the free app below and create your best 11-man team for Sunday’s TWO Premier League games – oh, and you’ll need to pick a captain.